Garden lovers have more than RHS Chelsea to look forward to this year. 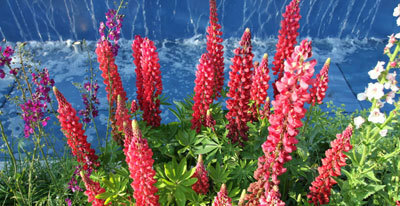 Ireland’s premier garden show bloom will be staged in Dublin’s Phoenix Park Thursday 30 May to Monday 3 June inclusive. In Ireland’s year of The Gathering, this is billed as The Gathering of Gardeners and more visitors than ever - upwards of 80,000 – are expected over the five days. bloom has 17 incredible show-gardens, a grand floral pavilion and an entire ‘village’ of artisan food and crafts to enjoy. And, with no restrictions on bringing plant products from Ireland into the UK, visitors can shop to their hearts content, whether buying seeds, plants or other garden goodies. “Not only is bloom a fantastic show, but visitors can fill the car boot, at no extra charge, when they travel by ferry” points out Irish Ferries head of passenger sales Dermot Merrigan. On-the-day entry tickets for bloom cost 20 Euro, but look out for special offers for UK visitors, saving up to 50% and publicised in Gardeners World, Gardens Illustrated and other magazines. Return ferry fares start at £209 for a car and two adults from Holyhead to Dublin on the cruise ferry Ulysses. A package with Irish Ferries Holidays, including ferry crossings and three nights’ B&B at a three-star hotel starts at £ 318 in total for two people.